Pork chops go on sale frequently here, so I'm constantly trying to find something new to do with them. One of my favorite ways to prepare them is simple: saute them & serve with a chutney. We've tried a mango chutney before & the boys loved it but mangoes are pretty expensive, especially when they are out of season. The first apple chutney recipe I found on MarthaStewart.com used cayenne pepper, which I'm out of, so I kept hunting. I finally found one from Relish that used allspice instead. 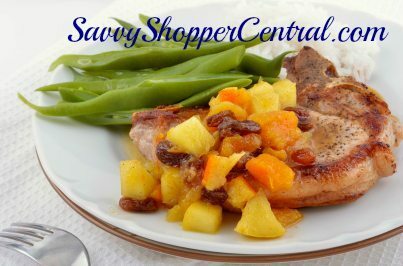 My favorite part: This is a 30 minute pork chops recipe, so I don't have to worry about spending hours in the kitchen! Prepare chutney by melting butter in a large skillet over medium-high heat. Add apples & saute 4 minutes. Add craisins/raisins, brown sugar, apple cider vinegar, ginger, salt, allspice, and mustard & stir well. Simmer about 3-4 minutes or until tender (stirring occasionally). Pour into a bowl & cover to keep warm. Wipe skillet clean & heat oil over medium-high heat. Season pork chops with Mrs. Dash. Add pork to pan & cook 4 minutes on each side (or until done). Serve with chutney on top.